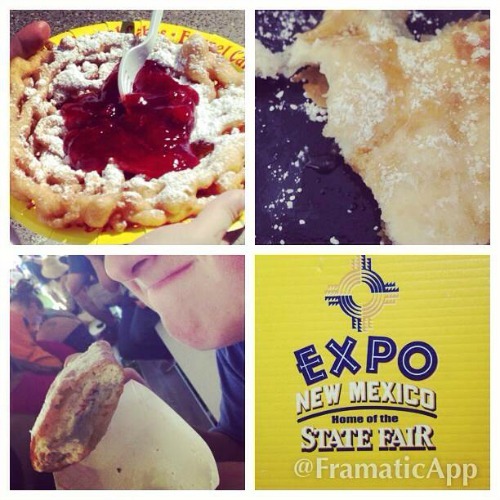 This was our third year to make a quick trip to the New Mexico State Fair. We had a nice time. It wasn’t a skillet throwing contest or anything... but we had a sweet time and a trophy came home with us. This year’s trip involved me deciding that we would go on Dollar Day and me not fully knowing what that means as far as traffic. So, we got onto the grounds much later than we thought we would AND I had to go to a funeral in the afternoon, so our time was limited. Still… where there’s a fair, there’s a way. Honestly, the best part for our family is watching Paul Louis compete in the Pee Wee Stampede. It’s stinkin’ adorable. And by adorable, I mean beyond all cuteness. Seriously. Take a barrel full of kittens and multiply it by ten. Then you have the Pee Wee Stampede. 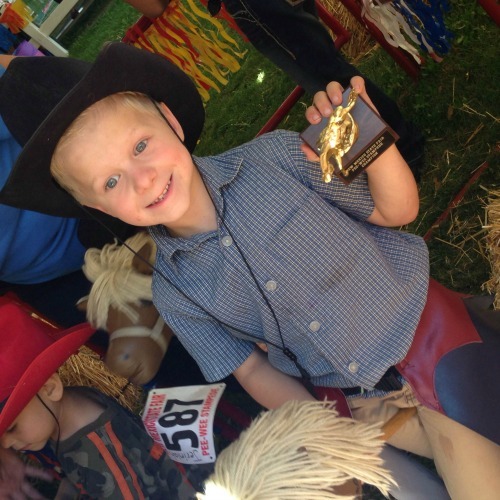 Three to six year olds, riding stick horses or bulls, running in kid sized rodeo events (bronc riding, barrel racing, and bull riding). Since you never quite know what kids those ages will do, its highly entertaining. The fact that they all have on chaps, cowboy hats, and rodeo numbers makes it almost too cute to handle. This year, Paul Louis won the bronc riding. To say that his fans were wild with support and the wild with joy at his victory isn’t an understatement. That makes Paul Louis three for three in the Pee Wee Stampede. Every year he has trophied. Out of twenty-five kids, three win trophies. He’s won one every time. He has to retire now, so I’m not sure what we will all look forward to next year for the fair. Going to have to pull ourselves up by the boot straps to find new fun. It will probably involve pigs. Just guessing. Unless they start the skillet tossing and then we all know who the champ will be. I’m not sure New Mexico State Fair will ever be as classy as the Kerr County Fair, so my skillet tossing days may be over. 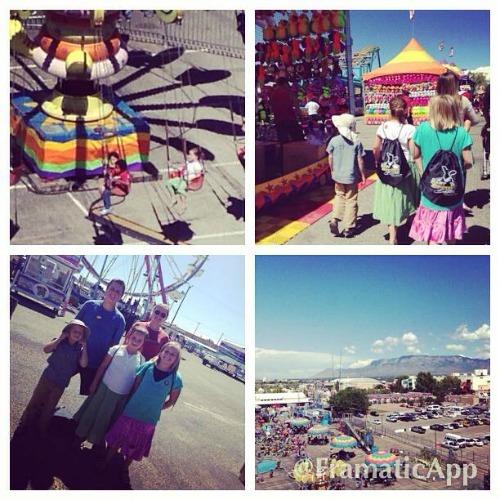 The other aspects of the fair, of course, are the food and the fun rides. What is it about fair food that draws us all in like moths to big ole lights? There is something, though. I have decently high standards for what I eat, but let me loose with all the money in the world and I’m eating fair food. Mmmmm. Good thing for my body that I don’t have all the money in the world. The first fair food I ever remember eating was boiled peanuts. My junior high friend, Shanna, introduced me to them at a county fair in Mississippi. It was love at first sight. Yesterday, there were no boiled peanuts. A friend introduced me to fry bread last year and so that was a must have. A few of the kids asked for a funnel cake instead of two fry breads (we share because I’m cheap… and they have to eat the sandwiches I tote in my backpack first). So…. Our fair food was fry bread with powdered sugar and honey followed by funnel cake with whipped cream and strawberry pie filling. Yes, it was pretty much grease and sugar. Noah used his own money to get a deep fried pop tart. Yes, seriously. He was disappointed that he didn’t find the donut burger until he had already spent his money. Poor guy. Normally, I am a big meanie and say no to the rides, but Dollar Day means that the rides are only a dollar each. So, each kiddo was able to choose a ride on our way out. Wow, I am definitely getting old because just looking at some of the rides makes me nauesous. Ugh. I can not watch spinning. Nope. It was interesting to see who chose what and then who could actually get on what they chose because their mama was not going to ride with them, despite needing an adult due to height issues (I loved the fact that I made the adult height cut off, whew). Turns out I still had a bit of meanie in me. Four of us rode the ferris wheel, one rode the swings, and one road something I didn’t see and can’t remember. Another tradition for the fair, for the Brouse House, is to hit Sonic on the way home. Happy hour coolness in a cup. Since it hit 84 yesteday, we basked in the ice cold beverages. All in all, it was fun. I wondered, as I walked around, ,what y’all would do. Seriously. I wondered about you, blog readers. Do you go to state or county fairs? Do you eat fair food? Do you do goofy activities? So… tell me! 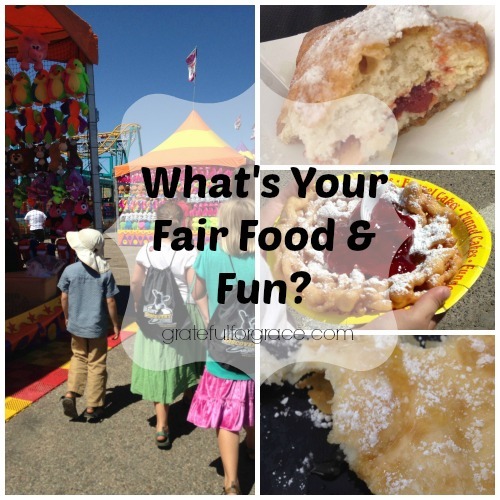 What is fun for you at the fair?